COSRX Advanced Snail 96 MUCIN POWER ESSENCE - Cherry Colors - Cosmetics Heaven! Did you know that snails are still a thing? No? Well, neither did I. Until recently when I stumbled upon the Asian beauty subreddit. And let me tell you, they worship snails (even if in a joking way). Well, snails are these fun little creatures that have been eaten and used for many centuries. Currently, they are a cuisine delicacy and I must admit that I looked away whenever my grandma and grandpa ate them. Nope, not for me. 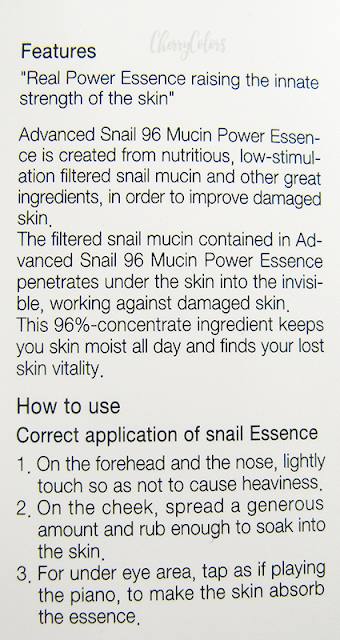 But in the last five years, snail secretions have found their way to skincare. It is used for wrinkles, scars, dry skin, and acne [source]. Usually, such products are a fad and stop being trendy and used about a year after they come out. 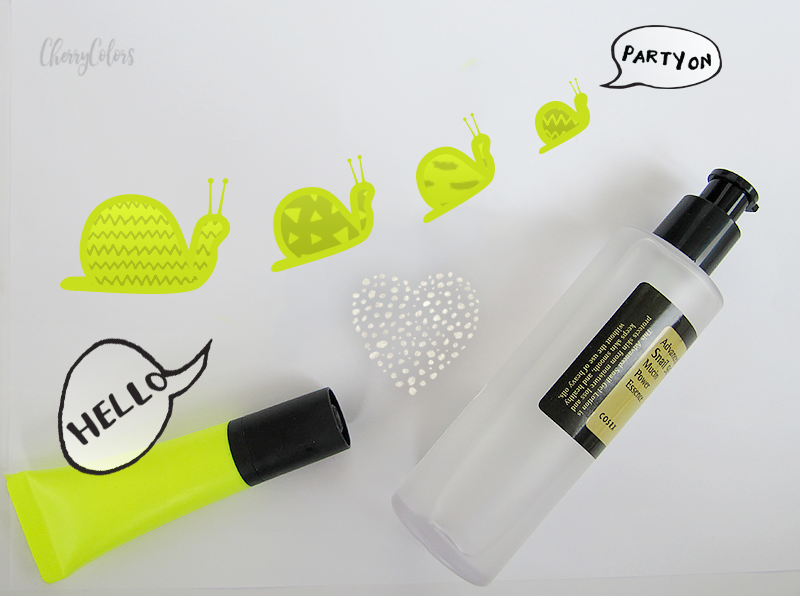 But snail mucus is here to stay. So it's not weird that after a couple of years from my first snail experience I went back for more. 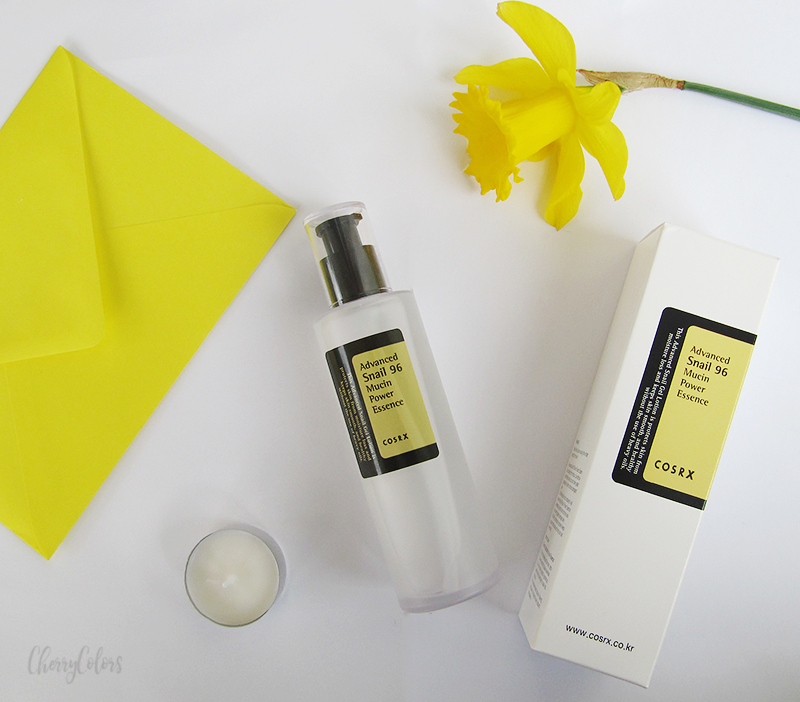 But this time, I decided to go with a brand I only read about - COSRX. I did so just because they have the cutest mascot (this funny dude) and well, their products are raved about in the blogging community. Especially their Snail mucus Essence. My skin has been acting all crazy and my usual routine didn't help. My epidermis was all dehydrated and I had skin flakes. Even talking became painful, my skin was so dried out! Nothing helped for more than a couple of hours. I was desperate! Well, until I realized that my Korean skincare order was about to come in and the Snail Mucin Essence may be the solution to my problem. The first time I applied it, I felt relief in an instant. I loved it! My skin drank it up in minutes and all there was left was a glowy skin and a happy me. Later, my skin got better and no new flakes would form on it. Even if my skin got back to my old combination skin type, I continued to use the essence. And it does add a boost of moisture to my skin. And the best part? It makes it heal faster. But one thing still worried me. I prefer if any kind of animals aren't harmed for the cosmetics I use. How do they get the snail secretions? 1. They make the snails go on a "bumpy" (slightly electrified) surface, which makes the snails excrete mucin. 2. They manually stimulate the snails (and a relaxed snail means more mucin!). You can see some videos on how do they do it, here and here. Killing snails makes little sense so I like the fact, that's a not trend anymore (before the snail mucin trend in skincare products they were crushing snails for their slime, but not anymore ah!). 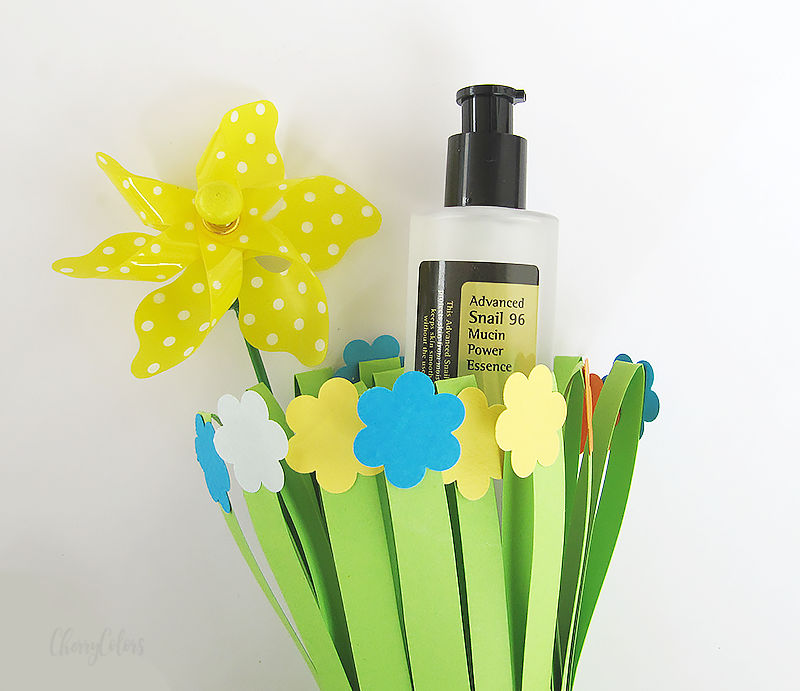 The essence is this smooth, sleek and a bit watery gel that has absolutely no scent. Because this is the thing I was worried the most, it made me happy. No scent = no weird thoughts while applying it on my face. After a couple of seconds, you can see that the essence gets a bit goopy, as in sticky. It's not bad, but it just means that it's best to first apply it all over your face and then use your fingers to pat on the most gentle areas (around your eyes). But now you may be curious and what are the other 4% of the ingredients in this Essence? Well, here they are ;). I am very happy with my purchase and I think this product will become my staple. It's perfect for all types of skin and even if you don't want to use it regularly, it's just perfect for a bit of pampering. Have a lovely day and snail on ;). *some of the designs/images in my first picture are made by the lovely Pink Coffie who is my lovely friend and sponsored them for my blog :).